In 1877, Charles O.Dowst was a bookkeeper. By 1879 he was listed under Dowst & Co., publishers, and two years later as editor and proprietor of the National Laundry Journal, when he was joined by his brother, Samuel. A decade later, the listing was changed to "Laundry Supplies". The World's Columbian Exposition took place in Chicago during the summer of 1893, at which a new type-casting machine, the Line-O-Type, was introduced. It was natural that this should interest the publishing Dowsts, and one was soon installed at their plant. Before long, they recognised that this equipment could be adapted to cast more than a "Line-O-Type". Soon, laundry accessories, such as collar buttons and small promotional irons, were being turned out. This line was quickly expanded to include tiny animals, whistles, rings, ships, etc., used for prizes in boxes of candied pop-corn (Cracker-Jacks) and by confectioners in wedding and birthday cakes, etc. By 1899 the firm was listed as "Dowst Brothers Co., Confectioners' Supplies", and by 1904 as "Metal Novelties". Two years later, Theodore S.Dowst marked the entry of the next generation as a book-keeper. He became a most inventive contributor, patenting the later cars and trucks in the 1920s and culminating in his patent of the Grahams in 1934. He stayed with the firm until his retirement as president in June 1945. He lived in retirement in San Diego, California, until his death only a few years ago. Dowst produced the first die-cast toy automobile with moveable wheels in 1911, a tiny limousine cast in lead, that proved very popular. These toys had no trade name until 1922. 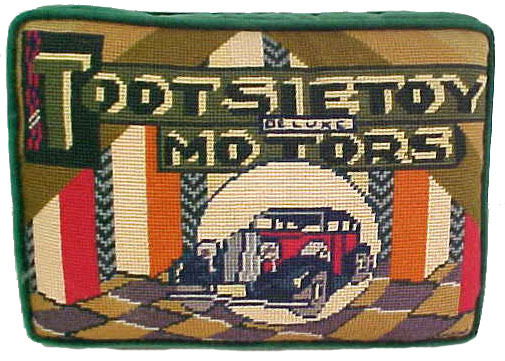 The name Tootsietoy was registered as a trade mark on 11 March 1924, having been applied for on 7 February 1923. The application stated that the name had been used continuously since 20 April 1921, but did not mention use of the name on any of their products except doll furniture. Tootsie was the name of Theodore (Ted) Dowst's daughter. 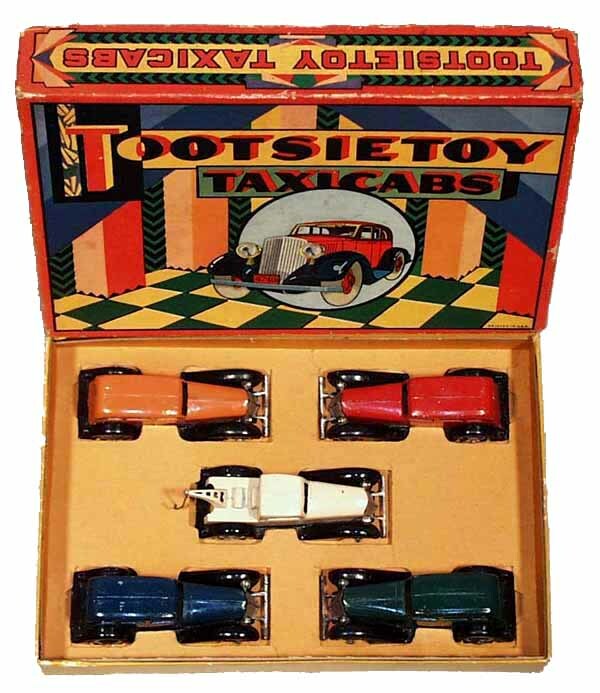 In 1933, Tootsietoy introduced an all-new series of models in collaboration with the Graham-Paige automobile company. 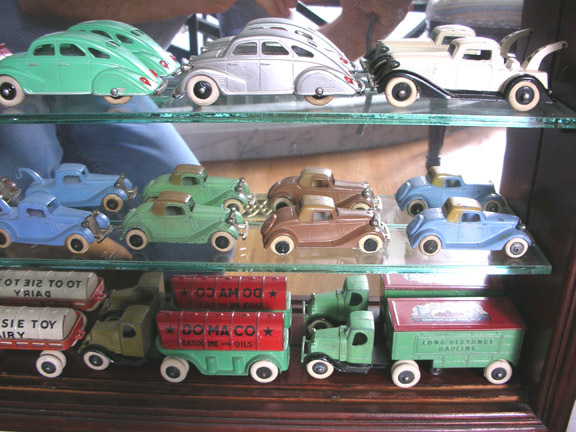 These new larger toy cars produced in O-scale (1/43 scale) had a patented system of locking separate castings of a body and chassis with the nail-like wheel axles, that retained the independently rotating wheels with a pinch at their right-side ends. A separate, silver or nickel plated grille that included a front bumper was riveted on the body. This design was copied by several companies including the British Dinky Toys and the Erie Toy Company. The same year, Dowst made an agreement with the Mack trucks company for reproducting their models in a smaller scale, later to be joined by a series of small 1934 Ford models using a single casting. Dowst successfully sued the Erie Company and obtained royalties from others that had copied the patent. 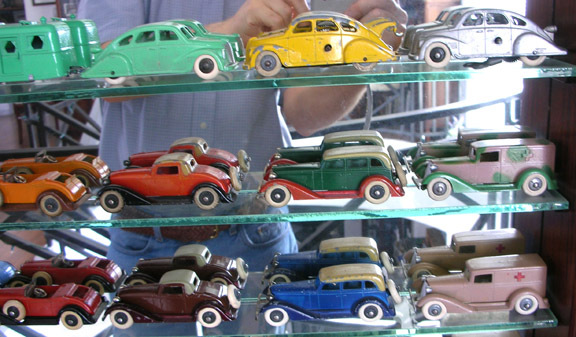 All these models are now highly collected not only by older gentlemen who used to poaly with the toys during their childhood in the 1930s, but by a whole new generation of young collectors fascinated by the beauty of these marvelous little toys. 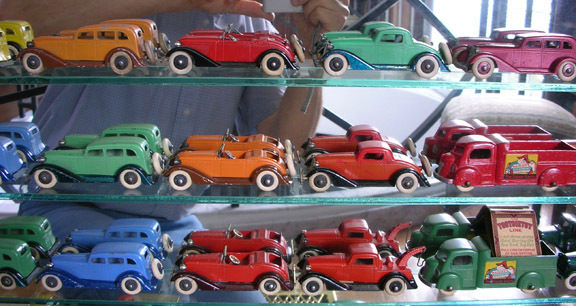 The Tootsietoy Grahams and later LaSalle and Linclon models were the most popular toy cars in America in the 1930s. This new series also introduced Zamak, a complex zinc alloy, into toy production. All previous Tootsietoy models had been cast in lead. 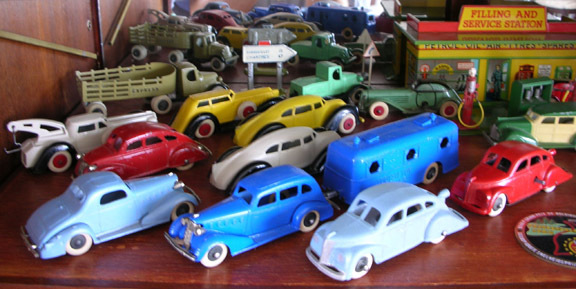 All are now highly collected not only by older generations, but by a whole new generation of collectors fascinated by the beauty of these marvelous little toys. Several series of Graham-Paige (commonly called "Graham" by collectors) were produced, in 3-window sedan, coupe, roadster, town car and commercial van bodies. The limousine and coupe were available in "straight" or "convertible" models (these having their roofs painted in a tan color simulating cloth top), and all except the vans were available with one spare tire on their trunk ("5-wheel") or 2 side spares ("6-wheel"). The sedan, coupe and roadster were also sold in a set called "Bild-a-Car", in which five chassis could be assembled with half axles and a center clip to five bodies, being two limousines, two coupes and either a roadster or a commercial tire-supply van. These had no spare tires and had specially cast bodies. On the picture at left, three of the Bild-a-Car limousines as well as 6-wheel convertible coupes and 6-wheel straight limousines mix it up with a rare orange Mack truck that came from a 1937 set. The yellow and black 6-wheel limousine was only available in a 10-car set, sold for a dollar. 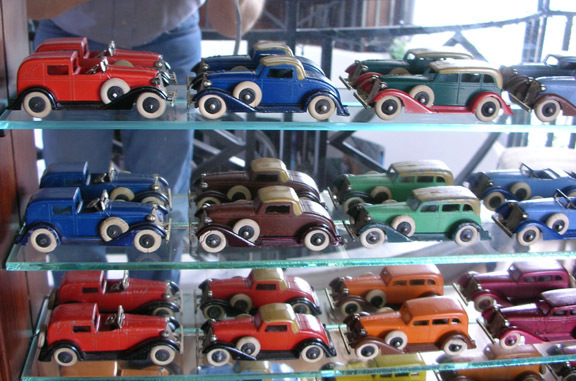 Each car purchased separately cost 10 cents. 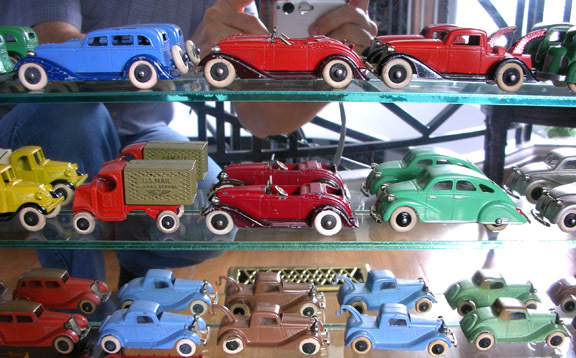 Because of their low cost and high detail, these were the most popular toy automobiles in the Franklin D. Roosevelt era of over-powering government and engineered depression. Today, thousands have survived, many in excellent condition. See the Graham chassis casting and markings variations HERE! 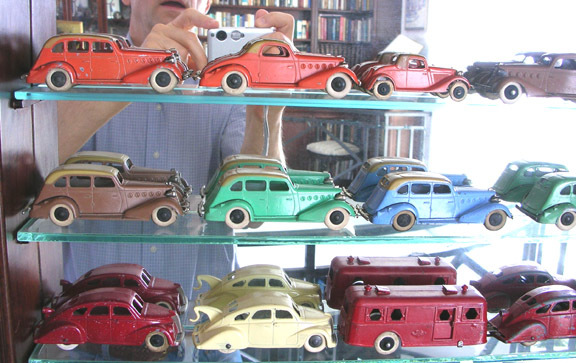 Left: the Graham 10-car set of 1933 cost one dollar. This particular set was issued in 1936 and is fitted with slightly different models than the original issue, and is now in a larger box. The box art is splendid. Right: the taxicabs set shows the 4 taxis with no spare wheels, solid axles and black chassis. This delightful needlepoint pillow was painstakingly crafted by Philippe's wife Kathryn. It is of the same basic size as the toy box except a bit thicker for comfort. Three were produced. Here we have a 1933 Mack tractor hauling three milk trailers, this set in pristine condition. The tractor and trailers do not have "duallies" wheels, but another version with a single trailer did. The tractor was of two-piece construction, with a separate chassis. In 1936 this changed and as can be seen below on the orange "Express" tractor and trailer, the casting is now made of a single piece and the trailer no longer has duallies. The red Mack "City Services" is very rare and part of a set issued in 1938. Made in the same scale as the Mack trucks are these 1934 Fords, sold as 3-window sedans and coupes in straight or convertible top versions. The tiny blue car in the orange trailer is the very first Tootsietoy automobile with moving wheels, produced in 1911 through the 1920s. 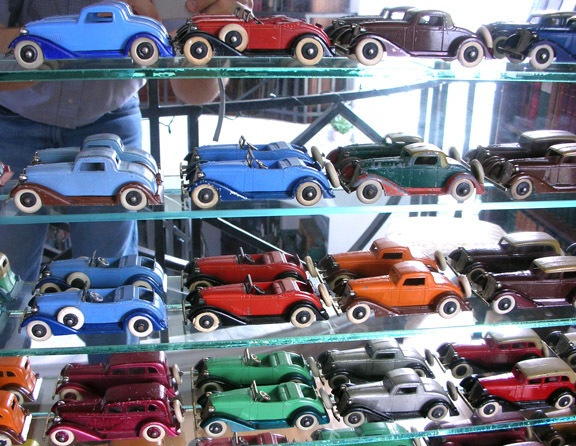 The 5-wheel blue sedan on the top shelf is the most commonly found color for the Graham line. 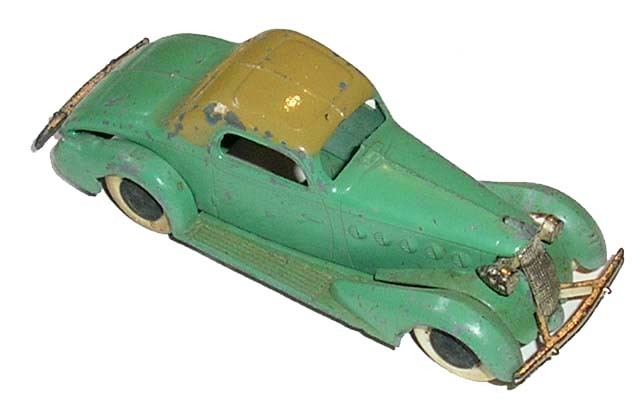 Next is a scarce roadster found only in the Bild-a-Car sets. The red and black wrecker was sold separately and also in many sets. More common color for this wrecking truck is cream and black, the yellow and black being more scarce. 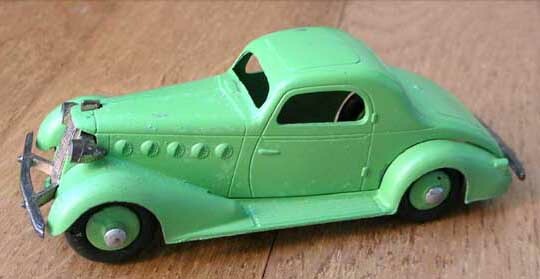 The green streamlined sedan is the famous Briggs "Doodlebug", a Lincoln prototype that led to the streamlined car era. The smaller red and tan mail truck is from an earlier, late 1920s series of Mack trucks and represents their last iterations, introduced with white tires in 1934 and only produced that year. This was cast in lead and used leftover castings, fitted with the wheels and tires from the 1934 Fords. Earlier versions had one-piece cast wheels. 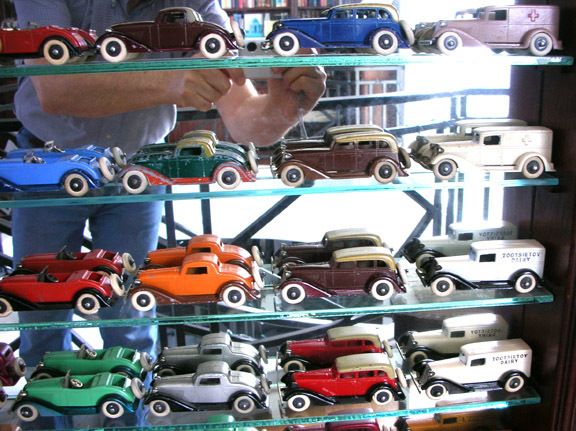 More '34 Fords are seen on the lower shelf. 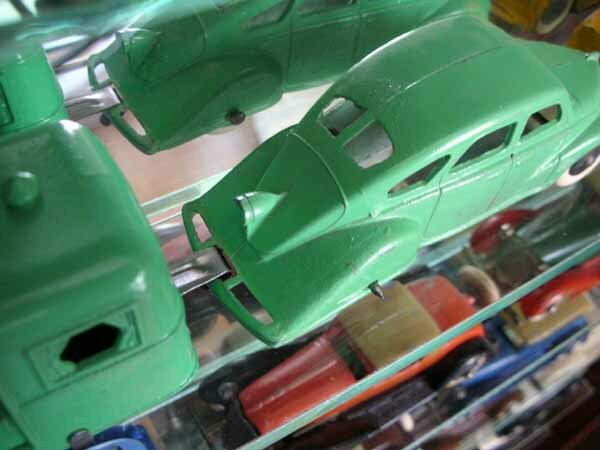 A green and a silver "Doodlebug" and a standard color Graham wrecker above a shelf filled with '34 Ford convertible coupes. On the bottom shelf, more Mack semi trailer trucks, the DoMaCo tanker (as in Dowst Manufacturing Company) and a rare "Long Distance Hauling" box car with the Chicago World's Fair decal. These were a limited edition issued for this event and sold for 20 cents in a special box. 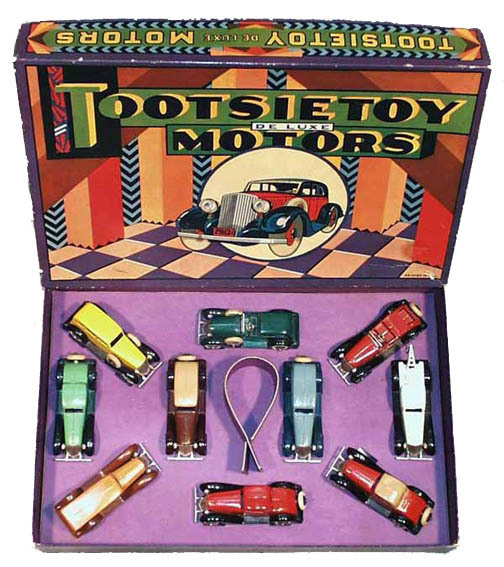 More Grahams, 3-window sedans with a single spare tire mounted on the back, these models called "5-wheel" in Tootsietoy collectors speak. The two International "Wrigley's" trucks are 1940 issues. The metallic rose Graham with matching painted wheels is quite scarce. It was the model sold by the full-size car manufacturer throught its dealerships. It came in a small red and white box. Issued in 1933 for only one year. The two orange vans were sold in sets only, the solid orange van offered in lieu of the roadster in the Bild-a-Car sets from 1935 to 1937. The Mack "Wrigley's" truck on the right side of the bottom shelf was an extremely popular item and can still be found rather easily. This being a 1935 edition with one-piece cab. An earlier 1932 edition has mostly disappeared because of metal corruption in the cab and separate chassis castings, making the survivors in decent condition quite rare today. Grahams "6-wheel" convertible coupes and sedans mix it up with town cars. Tootsietoy Graham colors followed a very clear discipline, and there were few variations from the basic colors. As an example, a green sedan could NEVER have a black chassis, and a blue coupe could NEVER have a brown chassis. The basic color combinations also were applied to a limited number of body styles. As an example, a town car could NEVER be orange, or light blue, or light green. The town cars came in four color combinations in "5-wheel" and "6-wheel" versions: silver and black, red and black, dark green with darker green, dark blue with darker blue. 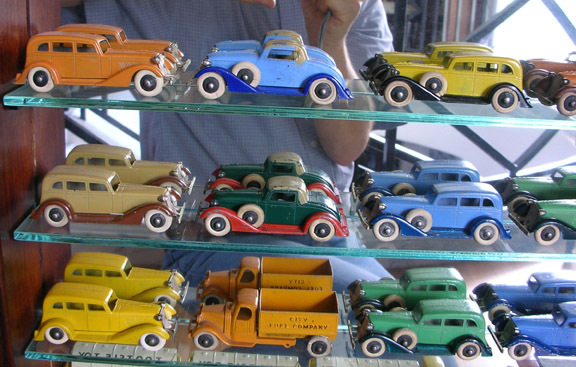 The blue convertible coupe on the top shelf bears the same color combination as the blue town car on the center shelf, as there was some crossover color sharing. Graham Bild-a-Car coupes (no spare wheels) in two-tone blue, light gray-blue and brown, together with roadsters in 5 and 6-wheel configurations, as well as straight and convertible coupes. The 5-wheel convertible coupe in bottle green with red chassis is hard to find, the 6-wheel being more common in this color scheme. 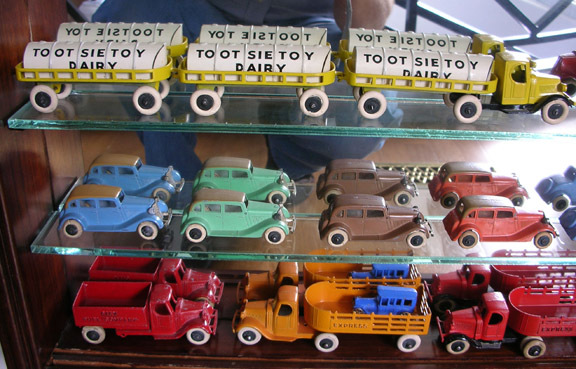 More convertible sedans as well as "Tootsietoy Dairy" milk trucks and ambulances. The brown and maroon sedan (second shelf from the bottom) is common. The two-tone brown is rare. There were no less than 7 variations on the ambulance, from 1933 through 1942. -Tan with silver painted grille. -Camouflaged and cast in lead with lead wheels and white tires. -Camouflaged and cast in lead with one-piece rubber tires/wheels fitted with a chrome plated steel insert. -Camouflaged and cast in lead with one-piece black tires/wheels and no inserts. These may have been issued postwar from leftover inventories when the company had to shut down toy production in early1942. In 1938, the last issues of the LaSalle sedan, painted pale blue and sold only in sets, had standard axles with pinched right-side end. Left: a grouping of LaSalle convertible sedans are shown here, the most common being the green example, the rarest being the salmon colored example. Right: Straight sedans with the very rare maroon model. 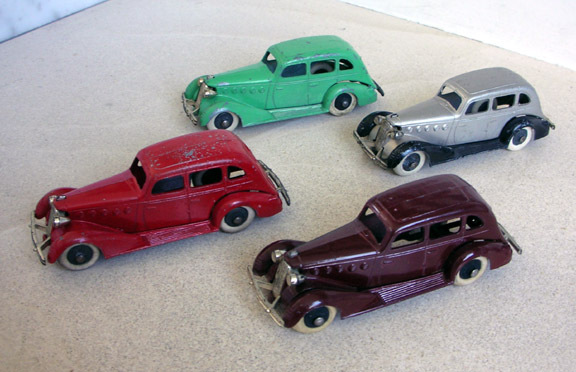 The green sedan as well as the silver and black model are the most commonly found LaSalle models in the Tootsietoy line. LaSalle always had body-color chassis except in one instance, that of the silver body that had a black chassis. A truly rare maroon coupe. It is not known, but unlikely that the maroon sedan and coupe were ever issued in "convertible" versions. Left: Most common color for the LaSalle straight coupe is pale blue. Many have some deformation of their bodies that grows in size and begins separating from the chassis. This is due to the unfortunate presence of minute amounts of lead in the zinc mix. Below, a scarcer green convertible coupe and a commonly found green straight example. Note the beautiful silver plated grille and front bumper, and the separate rear bumper, often found broken or missing. When the new Harley Earl designed 1935 LaSalle was annouced to the public, it created waves as its styling was so advanced compared to Cadillac's previous offerings. A convertible version of the new car was selected for that year's Indy 500 pace car. 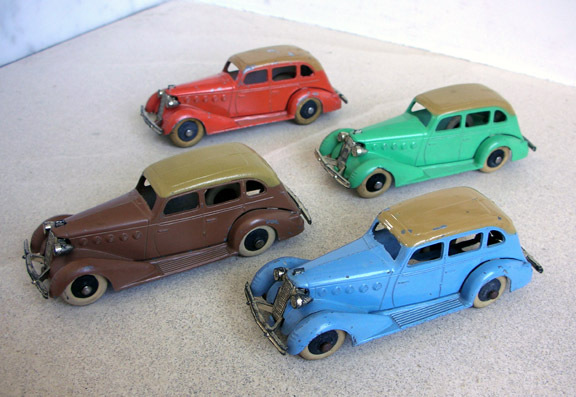 The Shure brothers, now in full ownership of the Dowst Manufacturing Company in Chicago, makers of the Tootsietoys die-cast models since 1911, struck a deal with General Motors similar to the one previously negotiated with the Graham company, that resulted in the production of their famous metallic-red promotional sedan issued in 1933. 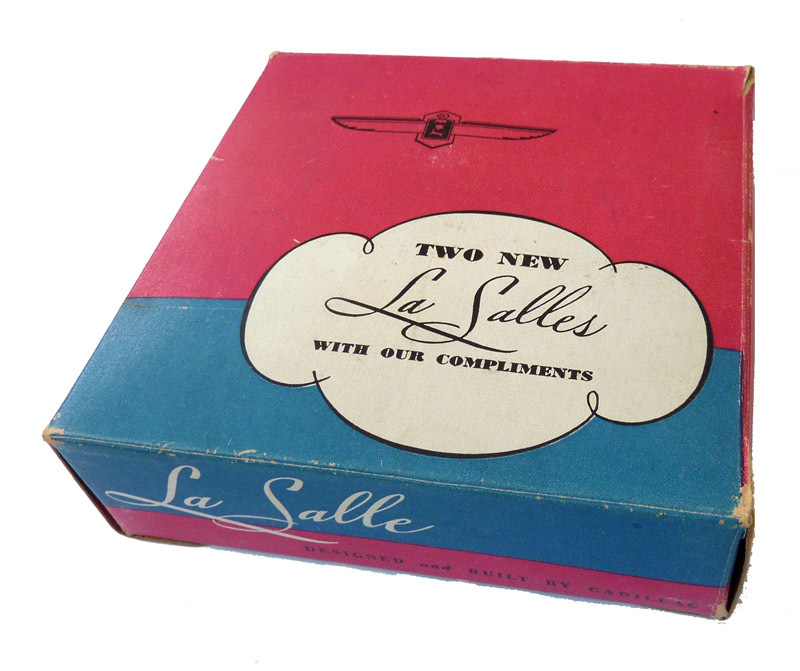 But they went one further, manufacturing for LaSalle, a gift set containing two beautiful models, a "3-window" sedan and a 2-dorr coupe. These two models are today quite scarce and fabulously rare when found with their original box. The set you see here has its own interesting history of its own, as it came from a member of the Don Lee family. The box is rather small, just large enough to contain the two models, locked on their display tray by wheels cutouts stamped in the black base. Quite scarce is this LaSalle promotional toy from the set for manufactured for GM dealers. Part of a two-car set with a LaSalle sedan in a tan color, sold in a special gift box, it features body-color wheels, black tires and split axles like on the Graham Bild-a-Car models. Below the LaSalles on top, are three Lincoln Zephyrs. The casting came from the modified molds of the 1935 Doodlebug. The Lincoln came in different versions, all of them a one-piece casting with integrated axle loops and blind hub on front. They were not fitted with separate grilles or bumbers as the Grahams or LaSalles. The nail-like rear axle received a special hub with a wheel that had a recessed inner face, and a special tool at the factory made a crimp on the axle so as to retain the wheel from floating across it. They were originally sold with a Japanese windup clockwork motor, but these did not have enough torque to move the toy beyond a foot ot two, so the hole in the casting was filled in the mold once the motor supply had run out. The ones without a motor are rarer. The yellow car is a "wrecker" and is fitted with a hook to lift stranded models. 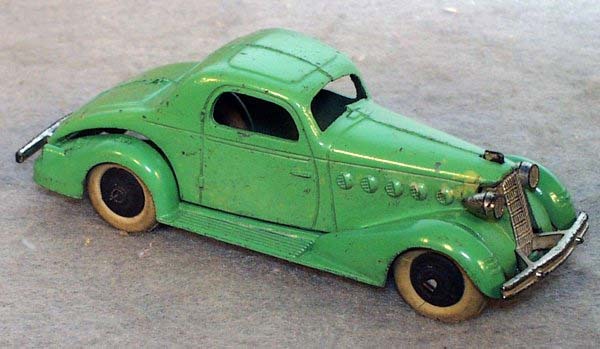 It is one of the rarest of all prewar Tootsietoy models and exists with ot without motor. A modified version of the Lincoln Zephyr received a different rear bumper so as to allow the use of a hook from a new trailer issued in 1936, called the "Roamer". Sold as a set in a pretty but rather flimsy box for 25 cents, the car and trailer were first clockwork powered, or as in this rare example, devoid of the motor. The delightful Roamer set in its original box. The box graphics are colorful. The lid reveals the car and house trailer locked in a cutout cardstock tray. This was sold with a Japanese clockwork motor that was never powerful enough to power the toy and that was dropped once the supply was exhausted. Later unmotorized versions are especially scarce, as are the surviving boxes. The Lincoln Zephyr model used in the Roamer set had a special 3-piece bumper, allowing the steel hook of the trailer to be fitted to the car. These are more scarce than the standard Lincoln models with two-piece bumpers. 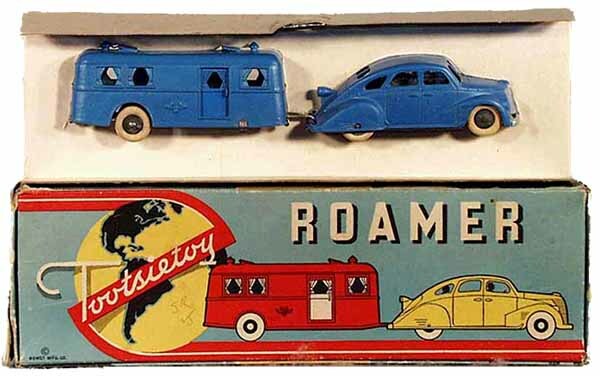 This royal blue LaSalle and Roamer trailer set were found in pristine condition in an estate sale in California. 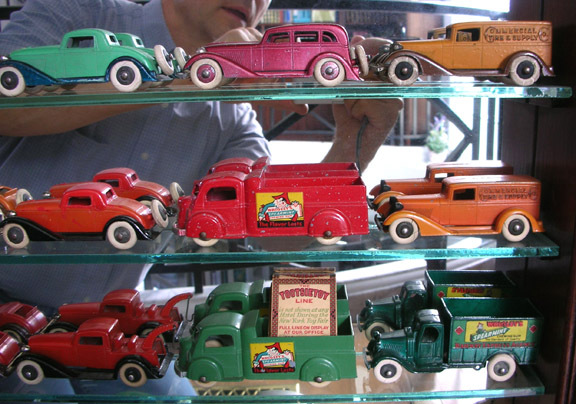 Not much is known of it other than the 92-year old owner had his son selling dozens of pristine Tootsietoy, Manoil and other toys that he and his brother purchased between 1933 and 1939. They were packed away during the war and never swa the light of day until the year 2008. The toys were all in pristine condition with very bright colors and were all marked underneath with the initials of either brother. The Roamer camping trailer was originally designed for the laSalle sedan, but was eventually marketed with the Lincoln Zephyr. This set does not show in any catalog, and the royal blue color is extremely rare on this sedan, Philippe having seen only one other over the years, and in rather sad shape. The father of the person living in the house where the toy was sold was originally from the Chicago area. Was this a factory sample obtained by his father? Hard to tell, but the authenticity is there, the two pieces obviously original.